I was lucky enough to visit TAGFarnborough Airport this week and pleased to receive a thorough tour- even round the new terminal which isn't officially open yet. 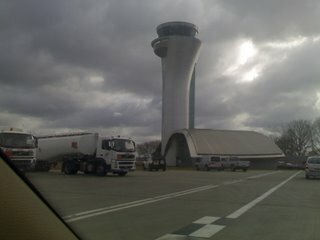 The new tower, terminal and hangars are of a space age design and built on a scale which should service the airport and its customers along way into the future. A hotel is due to join this stable of buildings within 18 months. I thought that the architecture owes alot to the McLaren Technology Centre in Woking, but despite both McLaren and Farnborough sharing the same owners, TAG, I'm assured this is a coincidence. I'd be surprised if a publically owned enterprise could have justified this investment given the time horizon and the difficulty in identifying the drivers of growth behind European exec jet travel. 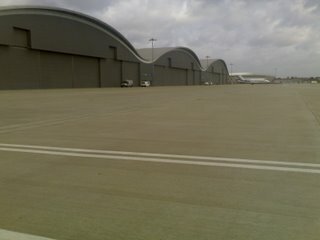 As this is exclusively a private jet airport (no chance of Ryanair flying from here in the next decade!) it was particularly interesting from the perspective of seeing how the other half live. The owners of the holding company know a thing or two about the executive jet business AND lifestyle. TAG stands for Technique Avant-Garde and that reflects the ethos of the activities to which the Swiss brothers who own TAG elect to apply their expertise. Farnborough is just one strand of their aviation portfolio and compliments the Formula 1 and luxury goods interests. Technically, TAGHeuer is no longer owned by the brothers, but their father's legacy lives on and with far sighted investments such as the new airport infrastructure, that success can only continue well into the future. A success, I hope, that will be trailblazed by their F1 team this year.